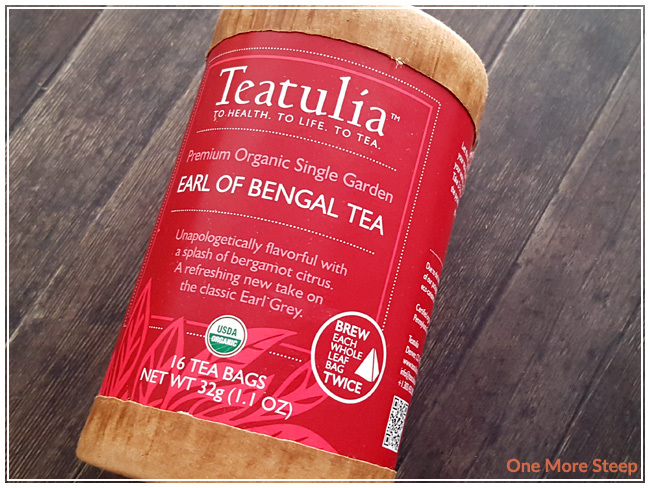 I received this carton Earl of Bengal Tea by Teatulia as part of a reward for backing the Kickstarter for Tea Journey, an online tea magazine. I was unable to find Earl of Bengal Tea on the Teatulia website, I based the pricing on their other 16 count teas. 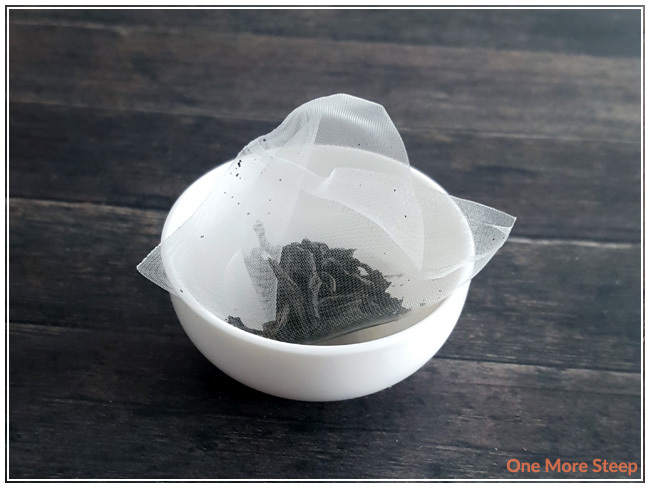 The last review of this tea on Steepster was from over 2 years ago, so I suspect that this tea was old stock being given away as part of the Kickstarter. I really like the overall presentation of Teatulia’s Earl of Bengal Tea. It comes in what they call an “eco-canister”, which their packaging describes as being hand crafted and printed on recycled paper. Earl of Bengal Tea is captioned as being a “refreshing new take on the classic Earl Grey”. The carton has some preparation instructions, says that each bag can be brewed twice, and that all of the teas from Teatulia are sourced directly from Kazi & Kazi Estate Ltd. in Bangladesh. It further goes to describe that it’s a single tea garden, and that Teatulia creates a sustainable partnership with the people there. Pretty neat! The carton is not air-tight, the 16 tea bags are in a clear plastic bag that is not sealed or resealable. This is a bit of a let down since air is one of the things that can cause tea to go stale. I put the entire bag into a plastic zipper bag just to seal them in. Each individual tea bag is made out of corn silk (as per the packaging) and they are compostable. The whole tea leaves are visible through the corn silk sachet, but they do look small. The bergamot flavouring isn’t as heavy as I’m used to with Earl Grey teas, but I am looking forward to trying it! Earl of Bengal Tea is made up of organic black ta and oil of bergamot. Teatulia recommends steeping Earl of Bengal in boiling water for 2-3 minutes, and then recommends repeating for a second cup. 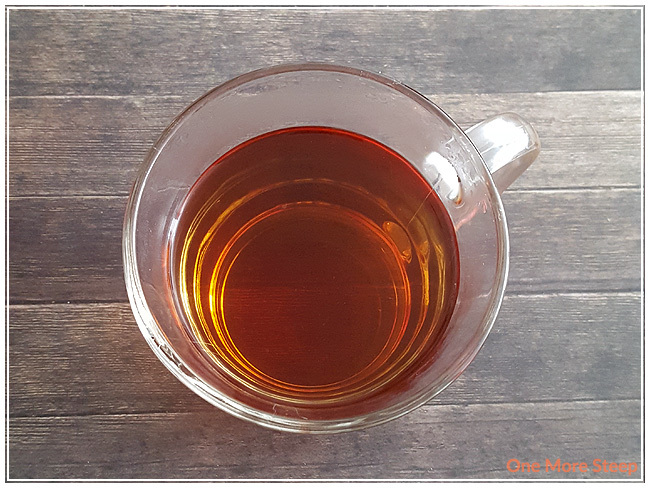 Earl of Bengal steeps to a lovely orange colour, it is quite clear and the corn silk sachet does a fantastic job of keeping most of the tea leaf debris out of the tea itself. It smells like a very mild Earl Grey as it still lacks a strong bergamot scent. I had steeped it for the full recommended three minutes. Tasting it, it tastes quite like a rather plain black tea. It isn’t bitter when steeped for the full 3 minutes, which is nice. Nothing in particular stands out about this tea though. I did try adding some sweetener to the tea to see if it would help bring out the flavour. I used sugar and found that the black tea base does stand out a little bit more with the addition of a sweetener. It tastes almost astringent with the added sweetness to the tea. The bergamot remains lost. The corn silk sachet itself does a good job, as you can see in the above photo that there is still some room for the leaves to expand. It is nice that it isn’t overly filled with leaves. I do think that the tea could have done better if they had been loose, so I may try this tea again with the leaves emptied into an infuser. Because it was recommended, I attempted to steep Earl of Bengal for a second time and it was a very lackluster tea. It was very weak and watery, I would not recommend steeping it for a second time. I didn’t like Teatulia’s Earl of Bengal Tea. As much as I wanted to, it just wasn’t my cup of tea. I would have expected something with a heavier hand of the bergamot oil, as it was meant to be a refreshing new take on the Earl Grey. 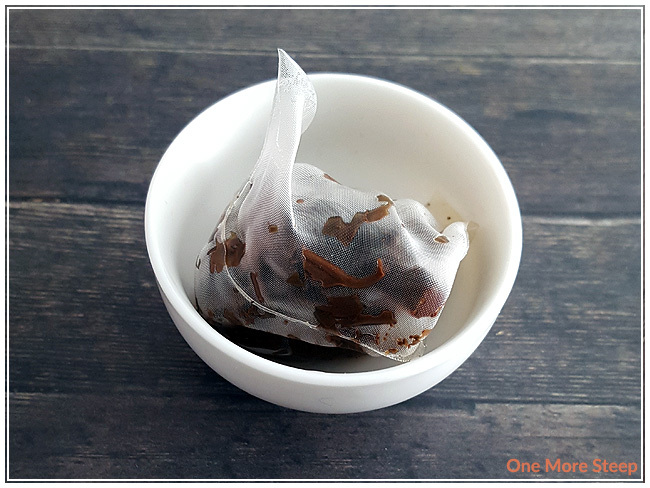 I think this tea works well if you’re looking for a black tea that could stand to be doctored up with some sweetener or cream, but overall I would say that there are other better (and less expensive) black tea options out there to try.